Wildlife is one thing some people hope to spot in their favorite park, or even in their backyard. 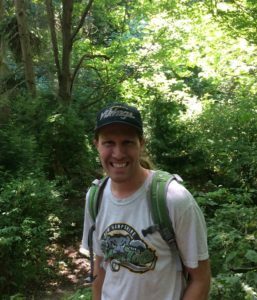 Green Seattle Partnership caught up with Professor Mark Jordan to hear some insights about a multi-year carnivore study his Seattle University Wildlife Lab is carrying out in some of Seattle’s forested parks. Jordan and his students get a unique perspective on our urban forest by capturing digital images and even snagging small hair samples from the animals that come out at in the evening and at night. Green Seattle Partnership: What is your green Seattle story? How did you become involved in this work? 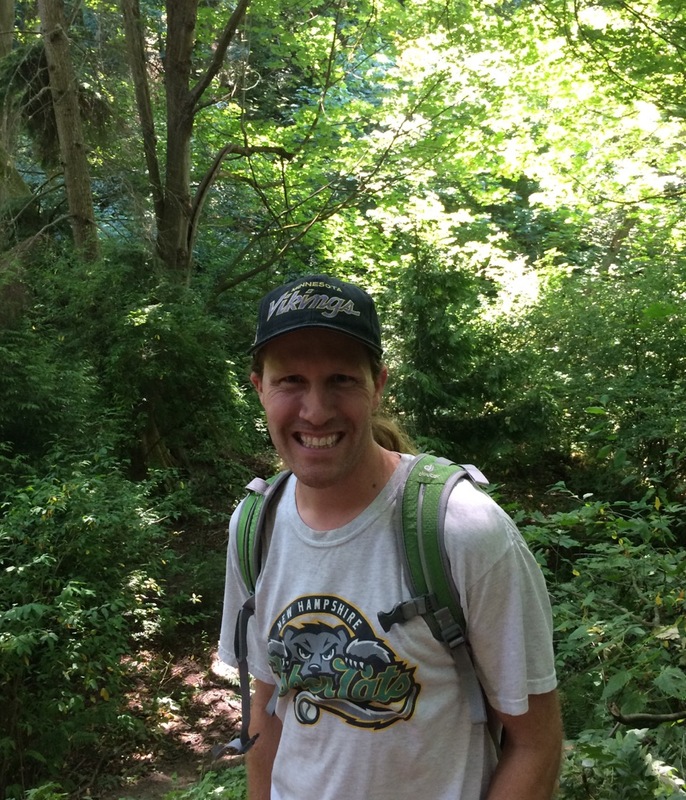 Mark Jordan: I moved to the Pacific Northwest for college, and I fell in love with the region. When I started at Seattle University five years ago, I knew that I wanted to learn more about the wildlife here in the city. 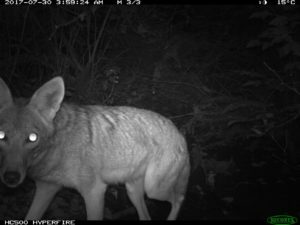 I had experience studying forest carnivores in California and Vermont, and it was easy to adapt those same methods to Seattle’s forested parks. How do you select the parks to sample? How do you sample for wildlife? We use camera traps to sample for wildlife. The cameras have motion sensors and infrared flash, so we can get images any time of the day or night. We try to set these up along trails. These trails can be either human or animal-made, because the wildlife will use both. We select the parks where we put out our cameras based on a mix of practical and scientific reasons. We’ve focused on Southeast and West Seattle because they are relatively accessible from Seattle University. One of the primary research questions we are trying to answer is which impacts of urbanization affect the species that live in our forested natural areas. To answer this question we need to sample in parks in a variety of different locations, from highly urbanized areas along the Duwamish River to less densely populated residential neighborhoods. We also try to sample parks of a range of different sizes, from neighborhood pocket parks to our bigger parks like Lincoln and Seward Park. What sorts of wildlife are you finding in the forested natural areas? Which animals are you most interested in? I’m particularly interested in studying carnivores because they are good indicators of the health of an ecosystem. My students and I have found a handful of different carnivore species in natural areas in Seattle. The most common ones are raccoons and opossums, though we also see the occasional coyote. We also get lots of pictures of house cats. What factors affect the presence of urban carnivores in the parks? Are they just in the parks or do they live in our backyards too? 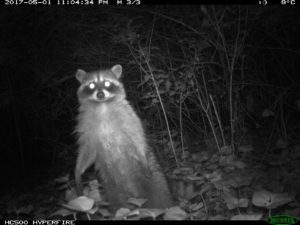 It seems that the best predictor of presence of carnivores, at least raccoons and opossums, is the amount of impervious surface around the park; that is, how much of the land surface is made up of hard surfaces like streets and roofs that don’t absorb water. Interestingly, while opossums prefer less urbanized areas, our data suggest raccoons prefer areas with more impervious surfaces. Although we haven’t set up camera traps in residential neighborhoods, I’ve talked to enough people with raccoons in their backyards that I’m sure many of these species are not shy about wandering outside of the parks. All species need food and cover. Our parks are good places to find cover for many species, and they’re also the best place to find food for things like Pileated Woodpeckers. 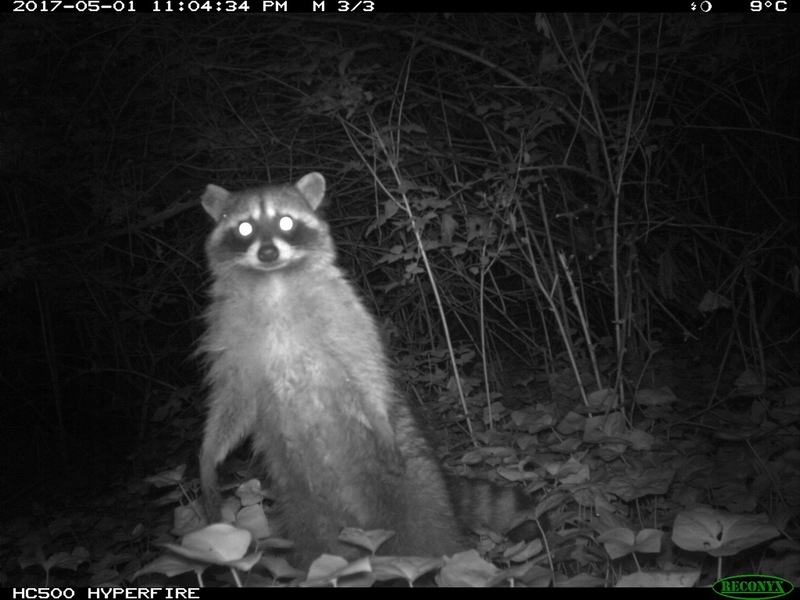 But some species, like raccoons, might have better luck finding food in our backyards. Are you able to derive some conclusions about the impacts to and benefits to wildlife through different phases of forest restoration? Because most of our photos are of raccoons and opossums, those are the only species I can say anything with confidence about. It seems like the amount of restoration in a park does not have an effect on these two species; the urban landscape features around the park seem to be more important than what is happening inside the forest. I suspect, however, if we looked at different species like birds or beetles, that we might tell a different story. If we’ve learned nothing from the study of ecology, it’s that every species is different. What is the most interesting/weirdest thing you have found while carrying out this project? I’ve been surprised at some of the places where we’ve found wildlife. We get raccoon photos in heavily industrialized spots along the Duwamish, and we’ve even seen deer right by I-5 on the north end of Beacon Hill. I think this goes to show that many species are adaptable to urban environments, and if we carefully manage our natural areas, we might be surprised at what decides to call our parks home. 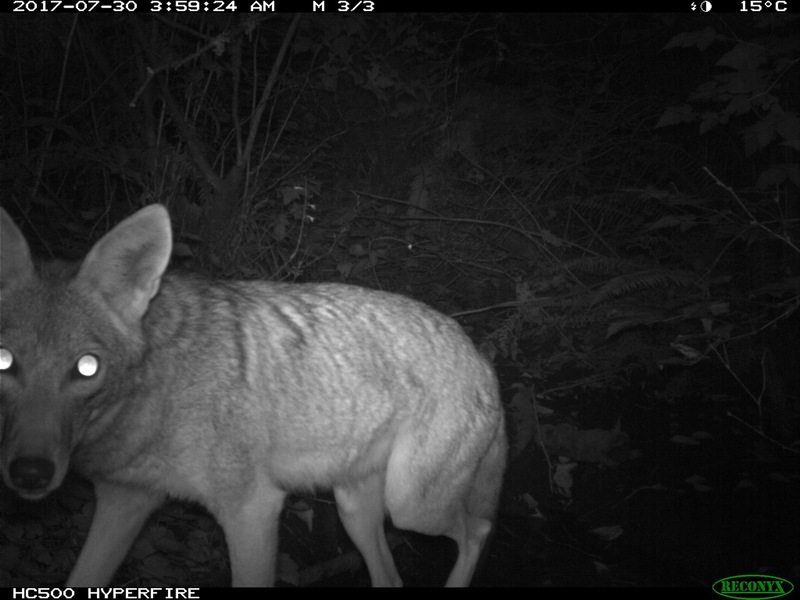 One can read more about Seattle University’s wildlife study on the GSP Research Page.